Update: February 25-26, 2019, firefighters successfully burned approximately 400 acres of the Bighorn Sheep Prescribed Burn. This page will be updated when another window opens to burn the remaining acres. Fire managers on the Canyon Lakes Ranger District are monitoring conditions on the Roosevelt National Forest to conduct the Bighorn Sheep Prescribed Burn in the Poudre Canyon in an effort to improve wildlife habitat and reduce hazardous fuels. Burning could begin as soon as February 25 and continue as conditions allow. 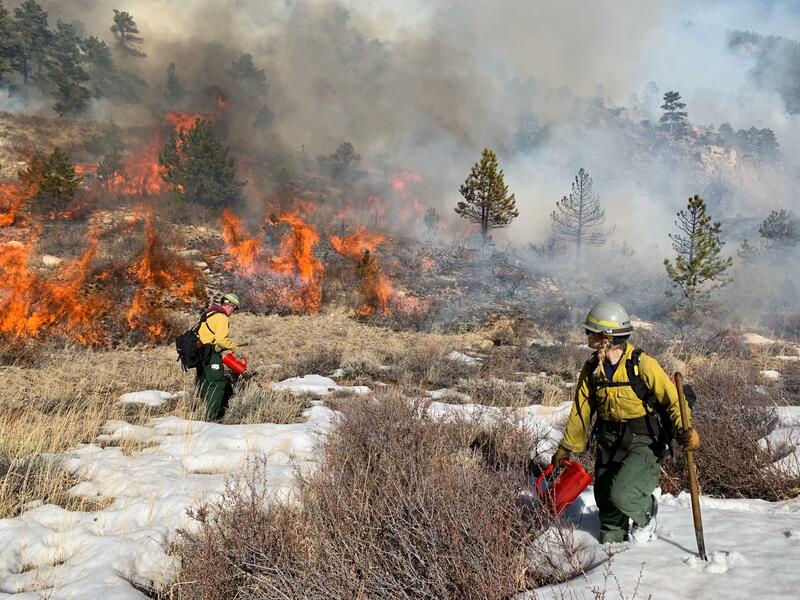 This prescribed burn is located on the north side of the Poudre Canyon near the Roaring Creek Trailhead, approximately eight miles west of Rustic. The project is 636 acres, with 85% of these acres on National Forest System lands and the other 15% on Colorado Parks and Wildlife lands. Burning expected to take place when south facing slopes within the project area generally have minimal to no snow and north facing slopes have snow cover to contain the burn. Appropriate conditions must be met before burning can take place, including favorable weather forecast (wind, precipitation, etc. ), fuel moisture, smoke dispersal and staffing. Weather is monitored throughout the burn and burning will be halted if conditions fall outside of the required conditions. In ideal conditions, as many as 500 acres could be burned in one day. The burn will be staffed with approximately 10-15 firefighters and may include support from local agencies and volunteer fire departments. Public and firefighter safety is always the number one priority in burning operations. There may be smoke impacts or temporary delays in access on the Roaring Creek Trail while burning operations are taking place. There are many hiking opportunities in the Poudre Canyon. Check for alternatives at https://www.fs.usda.gov/recarea/arp/recarea/?recid=36603. Detailed information about this burn is available at https://inciweb.nwcg.gov/incident/5676/. To get added to the email notification list for the Bighorn Sheep Burn, please send an email to rcloudman@fs.fed.us and identify this prescribed burn in the subject line. Prescribed fire smoke may affect your health. For more information see https://www.colorado.gov/pacific/cdphe/wood-smoke-and-health. Location Approximately 8 miles west of Rustic, Colo. Approximately 400 acres have been burned.